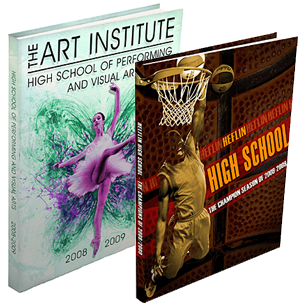 Yearbooks for High Schools & Elementary Schools. Colleges & Universities, Sororities & Fraternities. Military Yearbooks & Cruise Books. Yearbooks are more than just a collection of photos, or the original “face book.” They preserve the most memorable events of the year, from competitions, ceremonies, football games, homecoming and other sporting events, to club events and academic awards. They capture and record in a tangible volume the spirit of a particular moment in history – the history of the school and its students and faculty. Yearbooks allow us to look back fondly at the friends and teachers that we knew, and give us the ability to share that time in our lives with our loved ones and children yet to come.Fabric Hard Cover refers to materials you may be familiar with from the appearance of a Hard Cover book underneath its dust jacket. We offer many pleasingly textured fabric choices, including imitation leathers as well as top of the line cowhide leathers. Click here to learn more and view fabric swatches in a new window. Click here to learn more and view samples of Printed Hard Covers in a new window. 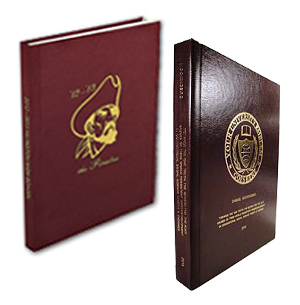 PHD Bookbinding offers FREE Yearbook design software and PRICE BREAKS on Yearbook orders of 30 books or more.